Given all the hoopla, ad campaigns and late night talk show chatter and buzz devoted to The Monuments Men. I’ve decided to divert on to a different tract. Oblige my friend, Ruth. Get my miner’s helmet, light and shovel and dig up a rarified gem of collaboration between two giants. John Frankenheimer and Burt Lancaster. Waist deep in one the best of the 1960s plethora of World War II films. Granted, it is of that variety of films where everyone. Including the higher ranking German officers spoke English instead of their native tongues That said. 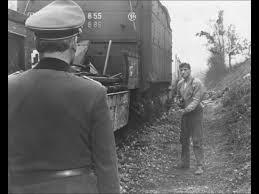 This film still has authenticity writ large and in Spades due to gritty, no apologies, on location cinematography in, around and outside Paris. In often dirty and smudge B&W. The fourth teaming up of Lancaster and Frankenheimer. After a rather loud altercation between the former and firing of the film’s original director, Arthur Penn. Resulting in the latter flying across the Atlantic to pick up the reins of a disjointed project and create a touch stone of Old School quality and story telling. The film begins in August of 1944. And the war not going well for Germany. With Russians heading west from Moscow and into the Fatherland. US and UK forces everywhere else. And looking to liberate Paris within weeks. In desperation. the German high command has assigned the Wehrmacht the task of gathering up plundered paintings, statues and other art treasures from Calvados, Vaires, Saint Ouen. To ship them to Berlin by train. 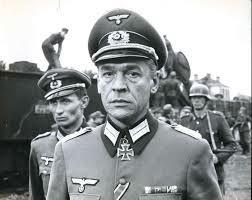 The man in charge of the operation is Col. Franz Von Walheim (Paul Scofield. In fine arrogant form!) supervising the pillaging of the Jeu de Paume museum. Whose curator contacts the French resistance and starts setting gears in motion. Keeping their actions local by sabotaging locomotives and cars in switching yards and side rails with some success. Until the Wehrmacht gets wise and decide to make an example of a Chief Engineer (Michel Simon) and executes him public. Putting the weight and onus on the broad shoulders of Paul Labiche (Burt Lancaster. Rarely more physically in touch with his character!). Who is surprisingly adept at any situation. And lives with an Innkeeper, Christine (Jeanne Moreau). Who has close cross-channel connection with Allied Intelligence. Who supply who add some much-needed, clever aid later in the tale. With the objective being to slow down, delay or sideline the trains carrying war booty. 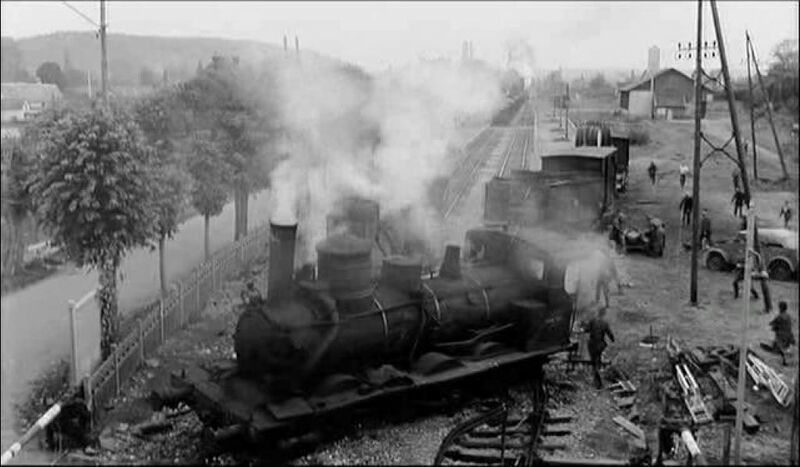 Labiche and others manage to derail a locomotive, tender and cars. Then separate a second locomotive and tender to crash into the first. Creating havoc and confusion for the Germans. And time to plan and execute more devilment, time consuming diversions. And to paint the roofs of several cars of one train white during a night time stop for water. In the hopes of sparing them from damage from low flying, strafing RAF Spitfires and Hawker Typhoons. All of this is prelude to the loading and climactic journey of a final train. Whose run is overseen by Colonel Von Waldheim and a well executed, final destructive showdown with Labiche. A just over two-hour sojourn to another time. Well detailed and with a deep respect for past history and the occasional vagaries of war and culture when they collide. While offering glimpses of how those on the ground and higher-ups out of sight and beyond reach adapt and attempt to remedy the situation. The Germans are German. Cold, efficient, sometimes brutal. Worthy of contempt. Yet, doing whatever is necessary to accomplish their task. Often going overboard in their reactions to sections of rail collapsing. While Von Waldheim learns to be more surgical in his responses to sabotage and delays. While the French are as clever and imaginative as their collective wits and dwindling numbers can manage. Slowly shifting from Labiche wanting to plant explosives and simply blow up the trains at first. To doing whatever he can to slow the process until the Allies arrive and liberate Paris. Two proven talents in Frankenheimer and Lancaster. Along with a more than able staff and crew performing some of their best work. Cinematography by Jeane Tournier and Walter Wottitz is more than can be asked for. Especially in the film’s several superb tracking shots. Where Labiche spots an oncoming and too fast train approaching from a high trestle. Tries to flag it down. Slides down a ladder. Hits the ground running. Leaps into the locomotive’s can to apply the brakes before being pushed off and switching the tracks. All done by Mr. Lancaster and in one take! Another later shots swells with suspense and tension as it follows Col. Von Waldheim (Paul Scofield) on a motor bike. Tooling around and through the marshalling yard . Across the yard and onto the final treasure loaded train. In a film that was made for B&W. Giving many shades of gray and white to enhance a situation becoming more desperate by the day. Aided by Allied bombing strikes and a spectacular train on train wreck. Completely devoid of Special Effects or models! Franklin Coen and Frank Davis accrue high marks for adapting the factual 1961 book, Le font de l’ art by Rose Valland. The art historian who documented the various works of art stolen from the Galerie nationale du Jeue de Paume and other galleries and museums by the Germans. The sound track by Maurice Jarre is more than adequate. Heightening tension and suspense when necessary. As well as occasional lighthearted whimsy. All parts and departments work together to create a setting and mood that moves the film and story along briskly. Without a single moment committed to errant distractions or sub plots. Creating a very John Ford kind of yarn in the hands of master technicians! A great movie well written-up Mike. Yes, Kevin did a splendid job of detailing why this remains a compelling film. Many thanks, Colin. Actually, that should be well written Kevin! This film had been bouncing around in the back of my head for a while. Brought forward through chance, opportunity, a few hints from Ruth over at ‘FlixChatter’. And the desire to send some love its way. 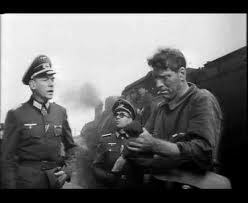 Another great team up with Frankenheimer and Lancaster. Also a well detailed and superbly constructed World War II film! Have always enjoyed this movie (though including Picasso as part of France’s artistic patrimony is a bit much), which in my view is best enjoyed if not taken too seriously. Arthur Penn started shooting but had a falling out with Lancaster so Frankenheimer took over, which is what also happened on Birdman of Alcatraz, which was begun by Charles Crichton. Great backstory, Sergio. Love this film and all the actors portraying these characters. Many thanks, my friend. It’s always fun when you drop by! The final scene in ‘The Train’, where the camera pans over the assorted and crated artworks by their artists always gets me. If you can get past the anachronisms and odd inclusion of sometimes foreign masters. Good catch on background between Frankenheimer and Lancaster! I think the seeds of future collaborations were planted by Lancaster. Who was impressed with the director’s occasional off camera angles used in ‘The Young Savages’. If I remember correctly, Kirk Douglas was taken on to replace Paul Newman in ‘Seven Days In May’. Douglas started lobbying to have Lancaster take on the role of his antagonist, Gen. Scott. And a minor classic was born! 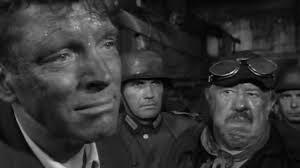 SEVEN DAYS is a really entertaining movie, perhaps the first Frankenheimer I ever saw. Having a script by Rod Serling didn’t hurt either I dare say! The several showdowns between Mr. Scofield’s arrogant German Colonel and Mr. Lancaster are a major part of what moves the film along. Both are in fine form. Though Mr. Lancaster doesn’t really have to raise his voice. An exceptional example of everyone reaching beyond their grasp. And succeeding! Thanks so much for the splendid write-up for one of my favorite films, Kevin. As a fan of Burt Lancaster and John Frankenheimer this fills the bill quite nicely. I had a chance to watch this on the big screen last year over the TCM Film Fest, but went with another classic. Can’t remember which right now (may have been the remastered Great Escape in the Chinese Theatre). I think one glorious aspect will always be its grand black and white cinematography and location shooting. That, and using and wrecking real trains in the process of telling a compelling story that involves art and WWII. I need to tee this one up once more, maybe screening it for my son to become enthralled with the film as I have. Great review Kevin! I’m more inclined to see this one that rewatch The Monuments Men. Frankenheimer and Lancaster definitely sounds like a great team! This worked out quite nicely. I’m glad you liked it. Given the choice, I’d opt for ‘The Train’. Knowing how HBO operates. I’ve no doubt that ‘The Monuments Men’ will be the flagship film offering of HBO’s Fall or Winter Seasons. And yes. Frankenheimer and Lancaster are a great team! Both understood each others’ capabilities and their collaborations were better for it!